Our Capitol turns 100 years old in 2017. 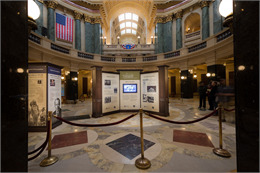 The Wisconsin Historical Society is helping the state's 100th Anniversary State Capitol Commemorative Commission celebrate by creating several resources for residents to enjoy. 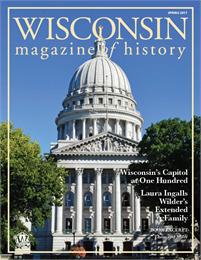 Three issues of the Wisconsin Magazine of History will feature pieces about the capitol and its history. 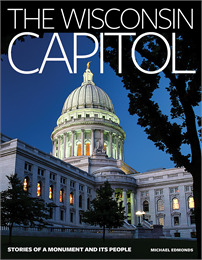 The spring issue (available to members in March) presents a photo essay by historian John Zimm on the iconographic history of the capitol. The autumn issue will profile little-known people and events connected with the capitol's last 100 years with an excerpt from The Wisconsin Capitol: Stories of a Monument and Its People (see below), and the December issue will include an illustrated "Curio" column discussing a museum object from the capitol. 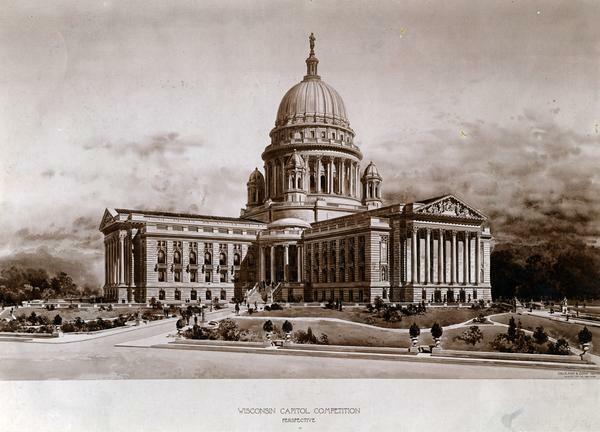 A handsome 7x9-inch, lavishly illustrated book, "The Wisconsin Capitol: Stories of a Monument and Its People," tells the remarkable story of the building and its predecessors, including the people who altered history from beneath its dome. More than just an architectural tour, it shares colorful tales about people who shaped Wisconsin from within the capitol—not only attorneys, lawmakers, and governors (from Henry Dodge to Scott Walker), but also protestors, reformers, secretaries, tour guides, custodians, and even Old Abe, the capitol's resident eagle. Combining historical photographs with modern, full-color photos by architect James Potter, it will be published in early fall. A 30-minute slide presentation with script is free for legislators, capitol staff, local historians, and anyone else who would like to give a talk on the building’s history. It's laced with true stories about people and events that will entertain community groups such as civic organizations, church groups, or classrooms (open notes display in Powerpoint). Presenters are free to download, edit, and repurpose it to meet the needs of their audiences. Download it here (PDF, 3.1 MB). 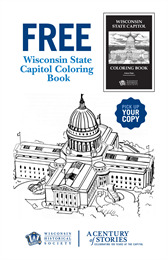 A free capitol coloring book is available for school groups visiting the exhibit in the capitol rotunda. The coloring book was made by Tony Rajer, who superintended the 1987-2001 restoration project. If you can’t visit the exhibit in Madison, you can download the coloring book here (PDF, 1.3 MB). Between 1914 and 1920, Carolyn Howe Porter lectured to community groups around southern Wisconsin about the new Capitol. Her husband, Lew Porter, had been the supervising architect during the Capitol's construction and she wanted to share the photos he had collected. In 2017, Porter's granddaughter, Martha Kilgour, resurrected the pictures Carolyn used 100 years ago, added notes about her grandparents and the building of the Capitol, and gave an illustrated talk for the centennial. She has generously allowed us to publish her presentation here. Be sure to view the notes for each slide in order to read her recollections while you look at the Porter family's photos of the then-new Capitol. View the presentation. Website of the 100th Anniversary State Capitol Commemorative Commission, with a virtual tour of the building, a list of centennial events, and much more. 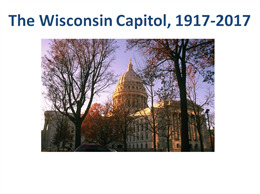 "Up in Smoke: The Story of the 1904 Wisconsin State Capitol Fire." An online gallery with more than 50 images of the disastrous fire that prompted the creation of today’s capitol. Historical newspaper articles about the four Wisconsin capitols. More than 2,000 images, including photographs, blueprints, maps, postcards and other depictions of the capitol, can be viewed in our Visual Materials Collection here.